Cook vermicelli as directed on package. Drain; rinse with hot water. Meanwhile, in small bowl, mix egg product, milk, 1/2 teaspoon of the salt, the oregano and ground red pepper until well blended. Stir in onions. In 10-inch nonstick skillet, heat oil over medium heat. Spread cooked vermicelli in hot skillet; pour egg product mixture evenly over top. Reduce heat to medium-low; cover and cook 13 to 15 minutes or until center is almost set. Remove skillet from heat. Sprinkle remaining 1/4 teaspoon salt and the cheese over vermicelli mixture. Cover; let stand 2 minutes or until egg mixture is set and cheese is melted. Serve from skillet, or run pancake turner around edge of skillet to loosen and slide out onto serving plate. Cut into wedges. 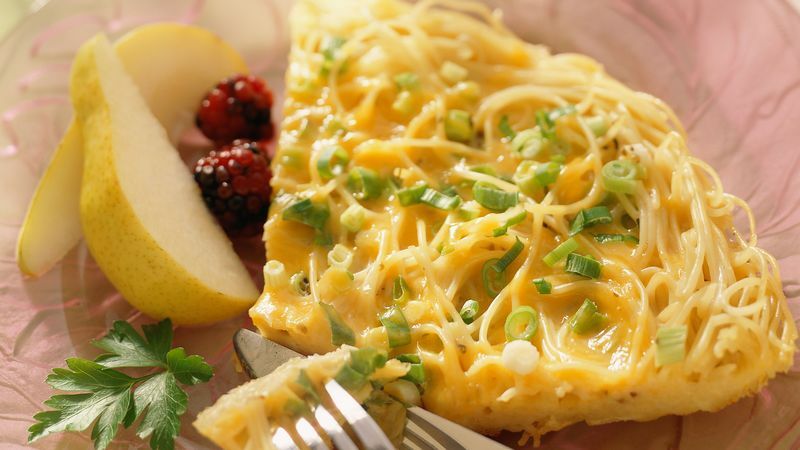 If desired, garnish with additional chopped green onions.